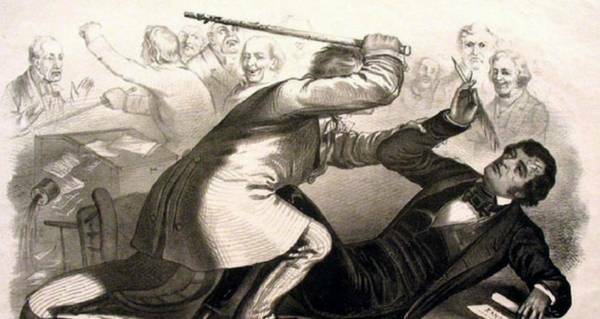 Though civil unrest had been brewing for years, many historians claim Preston Brooks' caning of Charles Sumner set the Civil War in motion. Wikimedia CommonsA lithograph portraying Preston Brooks’ caning of Charles Sumner. These days, the Senate floor is relatively calm. Sure, there are disagreements, and occasionally someone is asked to sit down, but at least no one has gotten into a physical fight in recent history. However, that wasn’t always the case. In 1856, Representative Preston Brooks, a Democrat from South Carolina, attacked Senator Charles Sumner, a Republican from Massachusetts, with a walking cane. The event became known as the Caning of Charles Sumner, and widely believed to be one of the events that lead to the American Civil War. On May 20, 1856, two days before his caning, Charles Sumner made a speech. During his speech, he denounced the Kansas-Nebraska Act, a law that caused a series of violent political confrontations over whether or not Kansas should be considered a slave state or a free state. He personally attacked the authors of the act, condemning them and pointing out hypocrisy he felt they committed. Upon hearing his speech, Representative Preston Brooks became infuriated. His cousin, Andrew Butler, had been one of the authors that Sumner slammed in his speech, and Brooks was intent on defending his honor. He claimed that Sumner’s speech had been libel, and intended to challenge him to a duel. On May 22, two days after Charles Sumner’s speech, Brooks entered the Senate chamber, along with two fellow congressmen. Brooks politely waited for the Senate floor to clear, and for the galleries to empty out, especially concerned with getting all of the women out of the room, so they didn’t witness what he was about to do. Finally, as everyone left, he approached Sumner at his desk. “Mr. Sumner, I have read your speech twice over carefully. It is a libel on South Carolina, and Mr. Butler, who is a relative of mine,” he said calmly. Then, as Sumner stood, Brooks brought a thick, heavy walking stick down upon his head. The blow was so strong, in fact, that Sumner was blinded by it, immediately falling to the floor under his desk. As Brooks continued to beat him, Sumner became trapped between the desk — bolted to the floor — and his chair, which was set into tracks to move back and forth. Wikimedia CommonsCharles Sumner, left, was attacked by Preston Brooks, right, after giving a fiery speech opposing slavery. Blinded by the blows, with blood dripping down his face, Sumner rose to his feet and ripped the desk off the floor, making a break for it. Brooks was faster, however, and grabbed him by the lapel, pulling him back to the floor and continuing to beat him. As the attack was occurring, other congressmen and Senators attempted to help Sumner but were held off by Brooks’ accomplices. 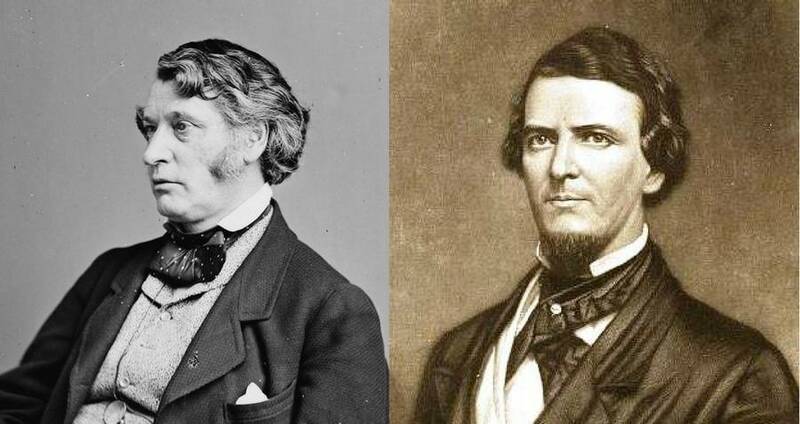 Congressmen Laurence Keitt and Henry Edmundson were each armed with their own canes and Keitt with a pistol, warning everyone against interfering. Eventually, two Representatives were able to restrain Brooks, who, once calm, quietly left the chamber. Charles Sumner was treated with medical attention and taken to his home where a doctor attended to him. Brooks was later arrested for assault, but the lasting damage had already been done. The attack had shown the public just how polarizing the issue of slavery was, and just how divided the government was. Brooks was immediately seen as a hero in the south, standing up for the rights to own slaves, while Sumner was seen as a martyr in the north, for defending a slave’s right to freedom. Though Brooks had admittedly intended to cause harm to Sumner — who suffered lasting brain damage and PTSD — he was immediately reelected after initially resigning. Sumner too, eventually made his way back to the Senate, where he remained for 18 years. Though Sumner and Brooks both recovered from the incident, the country could not. Within a few years, the Civil War had begun, at least in part due to the Caning of Charles Sumner. Next, read about the Australian senator who wore a burqa in Parliament. Then, read about why one congressman skipped Orlando’s moment of silence.